I had my yearly “paperwork day” today. As part of that ordeal I was sorting the Cisco Press book sales reports and stumbled across e-book data for my MPLS VPN books. I can’t tell you how well the Safari access is doing (electronic subscriptions are bundled with numerous totally unrelated items into the “Others” category), but the reports have separate line items for PDF and Mobile (I assume that’s Kindle) edition. The sales of these editions are negligible compared to the “regular” sales. Obviously even the highly technical audience is not interested in electronic books (or someone bought a single PDF copy that’s now enjoyed by the whole Internet) ... or you feel (like I do) that the reference books belong on the bookshelf. Once you’ve spent a few hours trying to understand the implications of IPv6, you quickly realize that the only significant change is the increase in the address length. 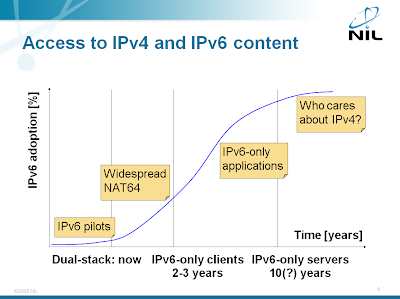 All the other goals that some people had been talking about were either forgotten or failed due to huge mismatch between idealistic view of the Internet IPv6 developers had 15 years ago and today’s reality. However, you still find mythical properties of IPv6 propagated across the Internet. Here are a few I’ve found; add your favorites in the comments. Numerous IPv6 topics are covered in my Enterprise IPv6 Deployment workshop. You can attend an online version of the workshop or we can organize a dedicated event for your team. IPv6 provides service/location separation. Total nonsense. The only mechanism used to find services is still DNS and it’s still used from the wrong position in the protocol stack. If you ever have to stand up and speak in front of an audience, the Confessions of a Public Speaker is a must-read. I've read the book a few weeks ago (and found it a fantastic resource), but never got time to write a review. Now I don't have to … Liz Danzico from A List Apart did a wonderful job. I while ago I wrote two articles for SearchTelecom that deal with traffic management in Service Provider networks and Deep Packet Inspection (DPI). The first article analyses whether you need dedicated boxes doing the traffic management in your network; the second one whether you really need DPI to manage the traffic. Traffic management and DPI are just two of the many topics covered in my Market trends in Service Provider networks workshop. Follow this link to register for the online event. Just in case you haven't noticed it yet: Petr Lapukhov wrote a great (and very long) article describing MSTP. It covers everything, from the basics to multi-region design and interoperability issues. Highly recommended reading. Thursday’s “Market trends in Service Provider networks” webinar was even better than I’ve hoped for. The audience was great: mostly System Engineers with 5+ years of networking experience, so we spent more time on interesting details. The presentation was initially targeted at sales support teams or account managers, but with attendees like I had in this session I could really go as far beyond the slides as needed. If you’ve missed this one, register for the next session ... and don’t forget: The next webinar explains how various VPN solutions really work. Numerous MPLS-based VPN services developed in the last few years have resulted in a total confusion. When someone told you he’s using MPLS VPN services a few years ago, he was almost always using the “traditional” MPLS VPN services (described in my MPLS and VPN Architectures book). Today, he could be using (layer-3) MPLS VPN services, pseudowires or VPLS. To help you understand the various options, I’ve created a VPN services taxonomy document in the CT3 wiki. This document will give you an overview of both Service Provider-offered and self-created VPN solutions. 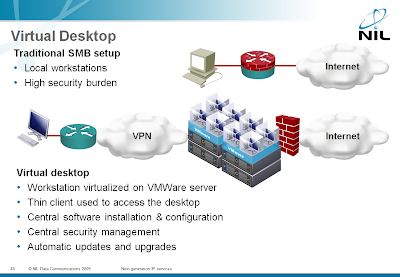 All these VPN solutions are described in more details in the Choose the optimal VPN service webinar (what is a webinar). You can register by following this link. Daniel Miessler described an interesting application of the Workstation-as-a-Service (now you know what WAAS stands for ;) cloud service (formerly known as virtual desktop): enterprise network will have to protect their workstations against browser-based attacks and the best approach is to virtualize the browsers and isolate them in a sandbox behind a firewall. Virtualization, virtual desktops and other security-related cloud services are described in my Next-generation IP Services workshop. When I’ve first heard about Passive Optical Networks, this blast from the past almost made my head explode. Imagine this: you’re replacing obsolete copper cabling with fiber and decide to create shared media access network similar to the widely hated cable networks. The only benefit of PON networks that I can see is that it only needs passive equipment at the concentration point. My list of drawbacks is huge, ranging from security concerns to service evolution. What’s your opinion? Would you like to correct my bearing? Passive Optical Networks are just one of the many topics covered in my Market trends in Service Provider networks workshop. If you want to register for the online event, hurry up; you have only a few days left. Majority of IT managers and enterprise network designers are somewhat confused by various VPN service offerings, from provider-delivered layer-2 and layer-3 VPN services to self-created IPSec VPN, SSL VPN, DMVPN and GETVPN. The Choose the optimal VPN service presentation gives you a comprehensive overview of all major VPN technologies, their benefits and drawbacks as well as high-availability design guidelines. This presentation is also available as an Internet-delivered webinar.